Numerous publications and design circles have spoken about how the legendary Lor Calma and his son Eduardo are so different from each other. The Philippine-educated father is gregarious, spontaneous and friendly, while the American-educated son is reserved, rational and serious. But in the things that truly matter, the two could not be more alike. In their household and firm, good design is put on the highest pedestal, and they strive to defend the same for the country. Lor radically changed the face of Philippine design, and Eduardo is right on track in achieving the same in his own generation. To accompany the article on Lor and his storied career in design published in our Superior Interiors issue, we talk to Ed about his own career challenges, and stepping into his father’s very large shoes. Why did you take up Architecture? Actually, it wasn’t really in my mind until I went to college. I just decided last minute, but I wasn’t really sure. I only got really interested when I started school, listened to my professors and talked to them about architecture and design. But you were into design already? Well, I used to draw a lot. Every summer, I would use the unfilled pages in my notebook for sketches and my dad would talk to me about design. And I lived in a house where everything in it was designed by him. When I look at other people’s houses and compare it to ours, I see that ours is not at all standard. It’s unique, and I felt it was a good design. No pressure to take it up? No, my dad didn’t pressure me at all. He didn’t even encourage me to take it. He just told me to do whatever I want to do. Did your father mentor you? Who else has the most influence on you? Yeah, when I was still young he would bring me to job sites, and he would show me what the designs are about. But it was more like him just expressing what he felt and what he liked, maybe because he didn’t have anyone to talk to at the time. When I started working with him, he would always put in his critique, but he won’t impose what he wants. It’s up to me if I want to follow it. My professors in school were also big influences. Then, when I joined Ellerbe Becket, Peter Pran and Carlos Zapata—both design principals—put me in a design team based in New York City. A lot of my work is also influenced by them, because I worked for them on actual built projects for five years, as opposed to schoolwork, which was more theoretical. Then, I met Stan Allen while I was taking my Masters at Columbia University. He’s an architectural theorist. Also, Hani Rashid, who is the brother of Karim Rashid. I like him a lot, even the way he set up his studio. In his class, we don’t stop at the conceptualization; we actually build our concepts by the end of the semester. Meanwhile, Stan would let me think of my own direction, or critique my design approach, but he would not impose. He’s a very knowledgeable person, I look up to him. How would you compare your design aesthetic with your father’s? My dad has always been progressive. His designs from 30 or 40 years ago are still valid until now. He heeds the real, fundamental need for good architecture that’s built well. That’s really what architecture is—building an idea using the finest material and craftsmanship. I guess, my way is more rational, while my dad is more spontaneous. He’s more fundamental, essential. He’s actually more minimalist than I am; I tend to elaborate things more. Generating ideas, of course, is very spontaneous, but I stick with one rationale and just follow it through all the way, while my dad can get into many different directions along the way. There’s always pressure, mostly from myself. I don’t know, it’s innate… I’m always competing with myself. Ed Calma talks about his experiences in the US and how they have influenced his current practice in the Philippines. What kind of challenges did you have to face that are unique to your being the successor to your father’s practice? What do you like most about your father? My dad did so much. He put up institutions. I haven’t put up any institution. He put up Philippine School of Interior Design, he made interior design a profession. He wasn’t just any architect who designed buildings or furniture; but also did his part to build the country. And he can actually do both furniture design and architecture—from minute scale to large scale. I’m a large scale person, I just don’t have the patience to do furniture detailing, which my dad is really good at. He has this innate talent of taking something out of nowhere and turning it into something extraordinary. At his age, he can still come up with these concepts. I wish I could still be like that at 86. As a person, he’s very generous, he’s very understanding and he’s always forgiving to everyone. Just like a father. What is your professional and personal relationship with him? I’m quiet, he’s more boisterous. Although we have two different personalities, we understand each other. We don’t have to talk too much to know what each other is thinking. When it comes to the practice, he just lets me do what I want to do. He doesn’t want to impose his authority. Even if he built this company, and he runs the risk of me driving it to the ground, he trusts me to lead the company forward. I guess he knows me well enough, that I would do it. It’s a big leap of faith. He initiated Modernism in the Philippines. Also, we choose what we work on. Lor Calma & Partners is not the kind of firm that just accepts every project just to make money. We still believe that architecture is an art form, so we’re very critical with what we design. Like a true artist, he wants to continue that approach for designing buildings, objects, lifestyle. 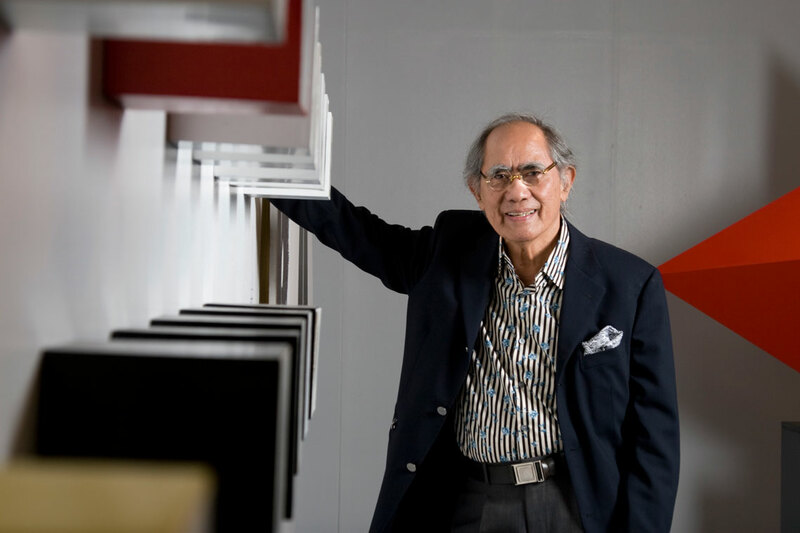 Ed Calma on his father Lor: He heeds the real, fundamental need for good architecture that’s built well. That’s really what architecture is—building an idea using the finest material and craftsmanship. Do you have any apprehensions or regrets about returning to the Philippines? A lot of people ask me why I moved back to Manila, when I could have stayed in New York. At first I did think I shouldn’t have come back, because working here is different from working in New York. In New York, the process and the people are more collaborative. They really put their ideas out on the table, and they’re not afraid of voicing out what they think. And people really produce. They’re really very passionate about work. You don’t see that a lot in architects here, although I have a few guys who are passionate. But now I can say I have no regrets at all. What would happen to this firm if you didn’t take up architecture? My dad would just close it down. There are some firms that have a corporate setup, like SOM. Whoever takes over will lead the firm, but in our case, we’re a very small firm, it’s very personal. If there’s someone whom I see would actually be able to lead this firm, I would just give him the reins, but I don’t think that’ll happen. We didn’t do succession planning. If nobody had taken architecture in our family, we would just close the firm. It doesn’t make sense to carry the name of Lor Calma and then degrade it and water it down. That’s how big firms are different from ours. I don’t want to be a big firm. Maybe not now, I don’t know what the future holds for the Philippines. What is your vision for the firm in the future? What do you hope to achieve? Just build good architecture. We’re still working on that. It’s a challenge to work in the Philippines and with some clients or institutions when they don’t understand what we do as architects. In Europe or in America, when you hire an architect, they kind of just leave them and allow them to do their work, produce something great. 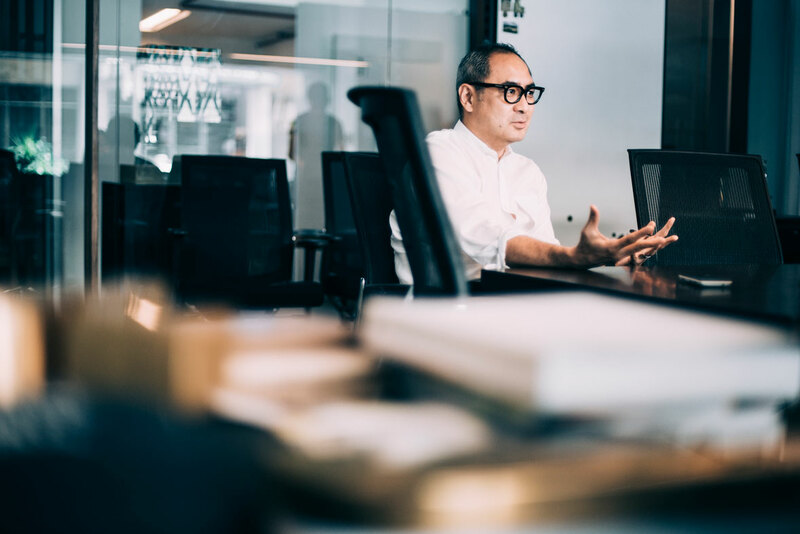 Here, there are lots of negotiations, and sometimes the clients have this preconceived idea of what architecture or design is, so they want to push and impose what they want. We don’t “dream big,” we just want to get good architecture built, which is already a struggle in itself. And hopefully, people will recognize that we did defend the profession. We did defend design. This story first appeared as “Lor and Ed Calma: In Defense of Good Design” in BluPrint Special Issue 3, 2014. Minor edits have been made for Bluprint.ph.